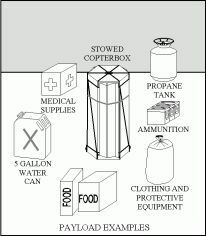 CopterBox is designed to deliver emergency supplies from a wide variety of aircraft with drop speeds of up to 140 knots. 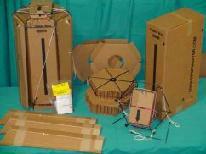 The corrugated paper box employs three rotor blades that use the principle of autorotative lift to slow it and its payload to a gradual descent prior to ground contact. CopterBox makes economic sense in applications where a parachute would not be practical or prudent. CopterBox requires very little time and training to pack and rig prior to launch. 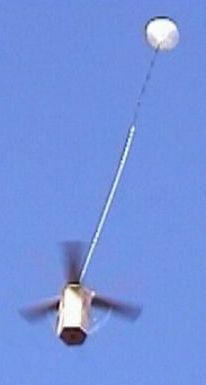 A welded wire rotor hub is used to protect the box prior to launch and to withstand the aerodynamic and centrifugal forces of flight during descent. Please email us with your questions and comments. CopterBox video, a white paper and the latest information are available via the link below. We need your input. New! Please scroll to the bottom of this page to see videos of CopterBox in action. Why CopterBox? Read about the advantages of using CopterBox versus conventional aerial resupply methods HERE. You will also be able to access all other CopterBox information including our literature, video, pictures, news, contacts and U.S. Government purchasing details. Call us for pricing information! We are fully production capable and taking orders for our current configuration. New and larger versions are in development.